The world lost a good man, a “mensch,” on June 16, 2015. 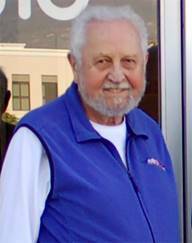 Donald Friedman passed away peacefully of old age at Cottage Hospital in Santa Barbara, California, just 1 day after celebrating his 88th birthday with his loving family. He is survived by his younger brother Murray and sister Phyllis Rosen, the family matriarch Rachel, 6 children Keith, Cheryl, Anne Kimberly, Cindy, Susie, and Georgette and spouses, 7 grandchildren and spouses, and 4 great grandchildren. At Don’s request, a private gathering will be held in early July. A public celebration of life will be held on August 29, 2015 for his friends, professional colleagues, clients and others who want to honor him for his lifetime of love and engineering innovations and accomplishments. Don always loved a party; he cherished gathering his peeps to brainstorm, debate, and perhaps join efforts toward the greater good. His ashes will be spread at sea, where he loved to marlin fish. Don was born in Brooklyn, New York on June 15, 1927, the first son of George and Gertrude Friedman. When he was 17, he entered the Navy and served his country in WWII. In 1948, he earned a Bachelor of Science degree in electrical engineering from Vanderbilt University. Don was married three times, all to wonderful women who enriched and fulfilled his life in interesting and unexpected ways. As his professional career continued to bloom and grow so did the children. Don and family moved to Santa Barbara the first time in 1961, when he worked for General Motors. In 1968 he permanently settled in Santa Barbara. Don also enjoyed 25 years with Peterje, his third wife; they went to the Symphony and traveled the world by land, air and sea! In his later years, Don could not hear or see well, but he was sharp as a tack and was filled with ideas and hope for the future. Every Wednesday, he ate lunch with “the boys” he worked with 40 years before. Professionally, Don is respected internationally for his accomplishments. Don identified his life’s most significant contributions to technology. He, as principal or with a team, designed, developed and produced: the periscope system for the Nautilus, the first nuclear submarine; a high-performance electric drive; the infrared seeker and guidance control for the Sidewinder missile, which was the first airplane-mounted missile able to track a target and shoot it down and instrumental weaponry in the Korean war; the 3 Lunar Rovers that landed on the moon, unfolded their wheels and traversed the lunar surface; the Minicars Transit and Car Rental System; experimental, research, large and electronic research safety vehicles; a dynamic dummy-occupied full-scale vehicle rollover crash test fixture (JRS) and quasistatic full-scale vehicle roof strength test fixture (M216); the HALO™ rollover protective systems for light truck vehicles used in, for example, the mining industry; and proofs of electronic drive-by-wire system algorithm defects. Don was a pioneer of vehicle crashworthiness and occupant safety research and testing, saving thousands of lives. He authored more than 150 technical papers and 7 patents, and testified before Congress on numerous occasions. He is responsible in part for more strict government vehicle safety standards. In his last 30 years, Don testified in more than 1000 personal injury and product liability cases; he helped win landmark cases against major vehicle manufacturers that forced recalls and safety improvements. Don founded the Center for Injury Research (CfIR), a non-profit foundation dedicated to improving vehicle crashworthiness and occupant safety, and crash-tested more than 50 vehicles. For more information about the public event, please email susieb@xprts-llc.com. In lieu of flowers, please consider a tax-free donation to the CfIR.